Trekking through the trails? 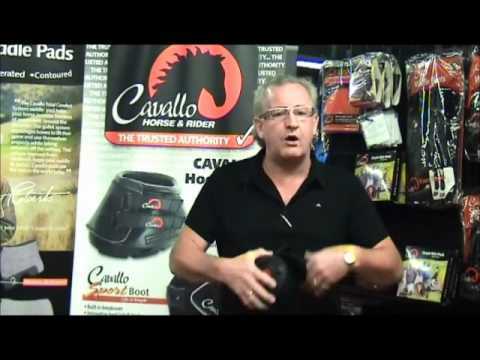 Be sure your horse is wearing Trek boots, Cavallo's top-of-the-line hoof boot for the total comfort and protection of barefoot horses as an alternative to metal shoes. They are lightweight, multi-purpose and all-terrain with a breathable Pro Mesh upper, and also great for replacing a lost metal shoe, rehab, or odd sized hooves. The Trek Slim tread pattern supports the frog and provides natural heel (skid) brake. The sole width is 1/4" narrower than the sole length, and may provide a better fit for narrower hooves. Sold individually. See measuring and sizing info at right. I have tried a lot of hoof boots on my big ole paint and this is the only one that does Not turn when he puts all his weight on it and turns. Recently rode for 3 hours in the desert and no rub or turning. Maybe just needed to be the slim sole but he is happy now, and so am I. So easy to put on and take off. No worries about his hind foot undoing velcro either. Best boots I have used on my horse yet. These are soft, light weight, very easy to put on and the first Cavallo boots I have used that don't rub my horses somewhat high heels. They wear better than the OldMac G2's I was using and are much easier to put on. I am glad that they come with an extra outside velcro piece because it tends to tear easily if pulled too tight after a while. Comes with extra straps. I have only had to replace one so far. Great product. Can this boot be used on only one foot or must all four be booted? How tough is it? Our horse has a chronic abscess and we have been using The Hoof Shoe on his front foot for over a year, since he is not a good surgical candidate, but the Hoof Shoe wears out pretty quickly. He gets turned out and climbs up and down a hill to get to pasture. BEST ANSWER: Hi. You could use the boot on one foot if he were stalled. However, if your horse is turned out I would use two front boots so that he doesn't experience uneven traction and feel as he moves around. The sole of the Cavallos is also pretty thick so there would be a height difference as well. Two front boots should be sufficient unless your horse is significantly sore behind. Then he may need boots on all four. The boots are very tough. My mare wore hers regularly in a pasture with varied terrain while she was healing from laminitis. I saw no signs of wear. I'm curious about the cause of his chronic abscesses. I have had horses and client's horses with hoof issues that we were able to resolve. I can't imagine a horse having to deal with abscesses for that long. I would love to hear more about his situation if you feel like sharing. I can't include contact info but I am an Unnatural Horsemanship trainer who writes for Horse Illustrated. Hope he gets better. I believe it would be real good for that. I haven't been able to use mine very much because I'm battling cancer and don't ride as much as I'd like. The few times I've used them they did good. The trails we ride are very rough and hilly. We go through lots of creeks and obstacles. Sometimes they rotate but they correct themselves. If you have to keep them on on a regular basis I would check them everyday just to make sure they're not rubbing sore spots. The ones I ordered came with extra straps. Hope they work for you. Most people use these for trail riding with horses that are otherwise barefoot. I have used mine for 2 years (light trail riding) with little wear to the boot showing, but have never left them on for turnout. If you turned out in them, I think you would want to boot both front feet to keep the front end even. It is hard to say how long they would last with heavy use, but they have been a great boot that is easy to put on and does not rub. Will the trek slim hoof boot fit my horse having hoof measurements of 5 1/2" length and 4 3/4" width? I want a good fit to ensure they stay on and do not want them to rub my horse. BEST ANSWER: These boots are sold in pairs. Sole width is 1/4" narrower than the length on these Slim Soles. First please double-check (always recommended!) the measurements by tracing closely around the hoof as the horse stands on heavy paper or non-corrugated cardboard. Unfortunately it's not possible to be certain over the phone or Internet. To increase your chances of success, you may wish to consult Cavallo directly at 877-818-0037. I'm not sure about your size but I measured my horse to the chart and they fit fairly well. The problem I have had is one always wants to rotate. I never had a problem with rubbing. I guess it depends on how long they're on. What's the difference between the regular and the slim? BEST ANSWER: My farrier told me to which ones to order for each of my horses. The regular I believe were a more round shape VS the slim being more narrow. Its best to have your farrier measure your horses feet for you for the correct size as I had to send them back twice to get the right fit. Also you must file your horses hoof toe almost every time you use them as if they grow even the slightest you cannot slip them on. But they do a wonderful job protecting their hooves and frogs from rock and debris. My 20 year mare could go all day again. For the slim sole, sole width is 1/4" narrower than sole length and may provide a better fit for narrower hooves. BEST ANSWER: This boot is in the process of being discontinued and we have sizes 2 and 3 left available. What boot would you recommend for barrel racing? BEST ANSWER: I'm not a barrel racer, but I don't think this one would work. More for protecting bottom and wall of hoof. It has a full bottom sole and is more for trail riding unshod. It works great protecting hooves and I've had no trouble with shifting or turning. how do i know what size boot to buy? are these sold as a pair or single? BEST ANSWER: They are sold single.